Planning your Christmas baking, but your kitchen at home is just too small? Did you know that our kitchens are available for rent by the hour? 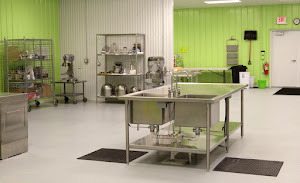 At Facility Kitchens you can get your holiday baking done in half the time! Contact us today to schedule. Want to learn more about food safety? December 5 &6 is the next scheduled HACCP manager certification class in West Michigan. The class will take place at the Varnum Law Firm, located in the Bridgewater Place in downtown GR. Call Amy at 616.771.0557 for details.